Several NGOs and other activists in Gujarat and elsewhere are up in arms against the Union Home Ministry’s (HMA's) order suspending the Foreign Currency Regulation Act (FCRA) registration of Indian Social Action Forum (INSAF), a network of over 700 NGOs involved in grass root activities. 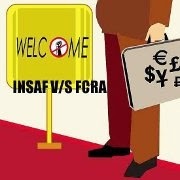 In an order on April 30, 2013, the Ministry of Home Affairs has suspended the Foreign Contribution (Regulation) Act (FCRA) registration of the INSAF, apparently for its involvement in what the Government considers ‘political’ activities like ‘Dharnas’ and rallies. The bank account of INSAF has also been frozen by the same order. Incidentally, the MHA order of April 30 came just on the eve of INSAF organising an international conference in Delhi from May 1 to 4. Activists in Gujarat have described the MHA action against INSAF as ‘state terrorism against civil society’. Prof Prakash Shah, convenor of Movement for Secular Democracy (MSD), said that civil society intervention is inevitable in a healthy democracy and citizens have the right to express their opinions on issues of public interest. Explaining the consequences of the MHA order, cultural activist Hiren Gandhi said that any NGO indulging in activities considered political can be debarred from receiving foreign funds. The definition of political activities has also been kept vague, which can be misinterpreted to deny foreign funding to any NGO, hinted Hiren Gandhi. If the provisions of FCRA,1976, as amended in 2011, are to be implemented in letter and spirit, any NGO receiving any foreign fund cannot participate in a protest demonstration against increasing incidents of rapes and the like, he explained. Jimmy Dabhi of St. Xavier’s Non-Formal Education Society said the Government too receives foreign funds for many purposes and questioned the motive behind what he called ‘state terrorism against civil society’. The activists said that any organisation which engages itself in common methods of protest action like Bandh, hartal, Rasta Roko, Rail Roko or Jail Bharo in support of any public cause, would be deemed as political in nature and, thus, denied foreign contributions for its programmes. Questions were also raised about the nature of funds received from ‘overseas friends’ of parties indulging in pure politics. A petition challenging the MHA order has been admitted in the Supreme Court and it is likely to come up for hearing after the summer vacation.